“Almost every significant breakthrough is first a break with old tradition, with old ways of thinking, and old paradigms”. Thomas Kuhn, physicist, historian, and philosopher of science whose controversial 1962 book The Structure of Scientific Revolutions originally introduced the term paradigm shift. Stephen Covey, author of The 7 Habits of Highly Effective People further elaborated on this concept. 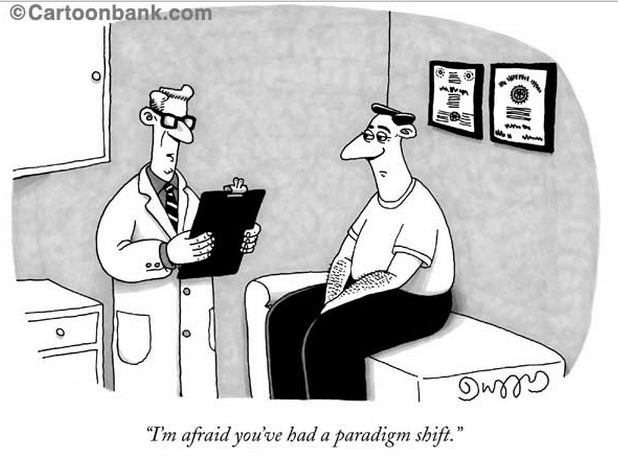 Paradigm shifts guide us to new ways of thinking, shedding light on new ideas and concepts previously unseen. They are “Aha!” moments, when you suddenly view everything from an entirely different perspective, ultimately shifting your paradigm. The Function First Approach is constantly evolving. A new era of growth, contribution and change awaits the movement industry, and we embrace this opportunity as industry innovators and educators. The Function First Approach is a principle-based outlook on movement and function. Principles are nature’s laws that forever endure and cannot be broken. Principles are fundamental truths that have universal relevance. If your parents or grandparents ever wonder why they’ve lost an inch or two, they need to look no further than the physics principle of gravity. Although we cannot see it, gravity is always there. It’s a universal principle. One of the fundamental principles that guide the Function First Approach is simply this: the body is an interdependent unit that always functions as a whole. And just as the body is interdependent, the Function First Approach operates much the same way. It’s not a methodology, but rather a principle-oriented, systematic approach, utilizing various perspectives to help guide the implementation of a corrective strategy. One such perspective contributing to our approach of viewing the body as a whole is that of Thomas Myers and his 2001 groundbreaking book Anatomy Trains®. I’ve had the privilege of working side by side with Tom over the last several years, and in 2012 was appointed one of his Associate Teachers for Anatomy Trains®. While traditionally, manual and movement professions have been viewed as independent of one another, the movement industry over the last decade or so has grasped onto many of the principles and insights of manual-based philosophy and teachings. Surrounded by such brilliant minds and immersed into the “manual world,” so to speak, I quickly discovered that, while the process behind manual and movement applications are indeed drastically different, our objectives, outcomes and ultimate vision are almost always identical. The anatomy-based knowledge of manual professionals is astonishing, and Tom’s is particularly so. In the same respect, Tom is often taken aback in his journey of movement comprehension. His own paradigms shift as he understands more about movement and function. Tom has taken a keen interest in our approach to Corrective Exercise, movement and function, which is why Anthony and I are thrilled to be collaborating with him in his hometown of Walpole, ME this July for three full days of advanced insights and movement strategies for creating lasting change. Combining the Function First and Anatomy Trains expertise into one event creates something far greater than we could ever accomplish separately. Together, we create an interdependent paradigm, completely revolutionizing how we approach working with clients, patients or athletes, while simultaneously bridging the gap between manual and movement industries. We understand that one of the most effective strategies for expanding your knowledge and growing your skill set is to surround yourself with like-minded individuals at live events. There is no substitute for immersing yourself into new ways of thinking, to step into the unknown and leave with a new sense of what’s possible for you and others. 2014 is an exciting time for us at Function First. We are celebrating 20 years since we first opened our doors. As we reflect on this accomplishment, we also look to the future and to our pledge to continuously raise the bar to even greater heights. Our revolutionary unlimited personal training package, X-Factor small group training, reactive training with the Core-Tex™, collaboration with Thomas Myers & Anatomy Trains, and the soon-to-be-launched online curriculum based entirely around the Function First Approach to Corrective Exercise are just some of the projects that are keeping us busy. Have you ever wanted to help someone in pain, but weren’t quite sure how? Function First is among the world leaders in Corrective Exercise intelligence. Since 1994, Anthony has been on the cutting edge of Corrective Exercise innovation and intellect, educating thousands of professionals at conferences, workshops, seminars and mentorships how to create Pain-Free living through corrective exercises. What if you could begin your personal journey of Corrective Exercise Mastery with Anthony and me anytime, anywhere, and at your own convenience? On May 1st, the Function First online curriculum will be accessible worldwide and available to anyone looking to geometrically grow his or her Corrective Exercise comprehension and application. The Function First online curriculum and Corrective Exercise Mastery is the culmination of all that Anthony has learned and assimilated in over 20 years of working with the chronic pain population. It’s designed to share all the principles, strategies and tools that make the Function First Approach so effective and powerful by taking advantage of the most current research in pain neuroscience, biomechanics, motor control and all that encompasses the bio-psycho-social model to overcoming pain. If you’re ready to become a master of helping people overcome pain through exercise, are committed to raising your standards of excellence, and are dedicated to acquiring the expertise to create lasting change in your clients, patients and athletes, then here is our invitation to you. Join us on this journey: an interdependent, centered approach with the ability to transform lives. You are currently browsing the Function First blog archives for March, 2014.